These are bright and modern holiday homes which have been constantly upgraded since they were built & can now boast very high insulation standards, landscaped grounds & strong WIFI connection for FREE. 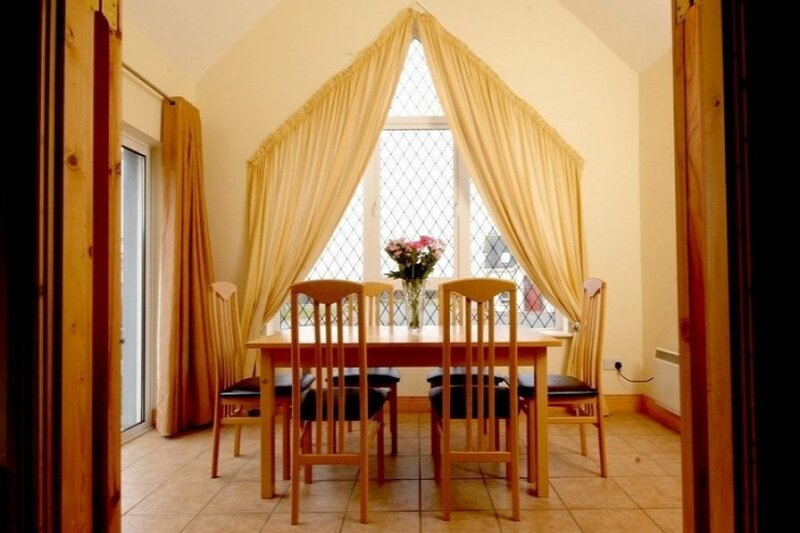 This 3 bedroom holiday home is bright and spacious with the lovely feature of a front sunroom. This sunroom opens into a spacious living area, which in turn adjoins a modern spacious kitchen. A double bedroom en-suite is also situated on the ground floor. The first floor has two spacious bedrooms with one triple room and 1 single room and a separate bathroom. A large open landing upstairs provides a generous space, which is well lit by windows at both ends. There is also a playground located onsite for hours of fun..
With horse riding being such a popular leisure activity for people in County Wexford, it is no wonder that there is such a selection of excellent equestrian centres to choose from. As well as leisure riding and beach treks, visitors can avail of quality-approved instruction for riders of all standards. Omniplex Cinema. This new multiscreen is also located close to the Drinagh Roundabout, on the road to Wexford Town. Details of the movies can be found in the local press & online.. Within the Kilmore Quay and Hook areas there are some of the most spectacular and varied diving in Ireland. With excellent visibility the diver can explore wrecks from 6 to 60 meters, study marine life on Coningbeg Rocks and the Brandies or watch seals, dolphins and diving birds around the Saltee Islands. Shore diving around Hook Peninsula, which is a favourite among Irish divers, boasts wrecks and deep open gullies full of marine life. Centres are available in Kilmore Quay, Hook, and Wexford Town, contact the Tourist Office for exact details. Wexford Wildfowl Reserve North Slob, Wexford. Tel: Facilities include disabled friendly Visitor Centre and a number of Bird Hides. Historic Wexford Town Noted for its medieval walls and narrow streets. It was a centre for the 1798 rebellion. Guided walking tours available Tel: .